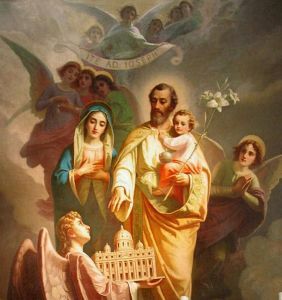 In the Legion’s prayers, St. Joseph’s name follows the invocations to the Hearts of Jesus and Mary, as he ranks next to them in the Court of Heaven. He was head of the Holy Family, fulfilling in regard to Jesus and Mary a primary and altogether special part. The same, no more, no less, this greatest of saints continues to render to the Mystical Body of Jesus and its Mother. The existence and activity of the Church, and therefore of the Legion, are sustained by Him. His care is unfailing, vital, possessed of parental intimacy; is second only in influence to the mothering of Mary, and is to be so appreciated by the Legion. Jesus and Mary were ever mindful of him and grateful to him for all he did for them. Similarly, legionaries must be attentive to him in a constant sort of way. Het Hoogfeest van de Heilige Jozef, echtgenoot van de Heilige Maagd Maria, vindt plaats op 19 maart. De gedachtenis van de Heilige Jozef de Arbeider, vindt plaats op 1 mei.